Feeding your kittens well from the very first day of life is crucial to their future health and longevity. Therefore, it is wise to do a little research on the nutritional needs of kittens and various brands of kitten food to ensure that they are getting exactly what they need. 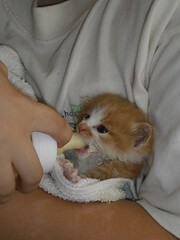 While feeding kittens is not a difficult task, there are some things that should always be born in mind. If the litter is still with its mother, then there is very little that you need to do to care for your kittens in the first few weeks. However, to make sure that Mother is able to produce enough milk, it is wise to offer her more food and water. Some owners choose to provide kitten food for a lactating cat, as it has a greater quantity of calories.